Congress is about to vote on HR 620 – a bill designed to weaken the Americans with Disabilities Act (ADA). 1 out of 5 people in the US has a disability, and the ADA provides us with the fundamental civil right to use public accommodations, go to stores, restaurants, hotels and other businesses just like our non-disabled friends, family members, colleagues and peers. Congress wants to make Americans with disabilities second-class citizens again. Your representative in Congress needs to know that they can’t get away with watering down the most powerful civil rights legislation of the last 30 years. That’s why people across the country are taking to social media to send the message #HandsOffMyADA. It’s up to us to show Congress and the rest of America that the ADA is worth protecting because disability is part of life and nobody should be left out or forced to wait outside. Any bill that tries to change that like HR 620 must be stopped. 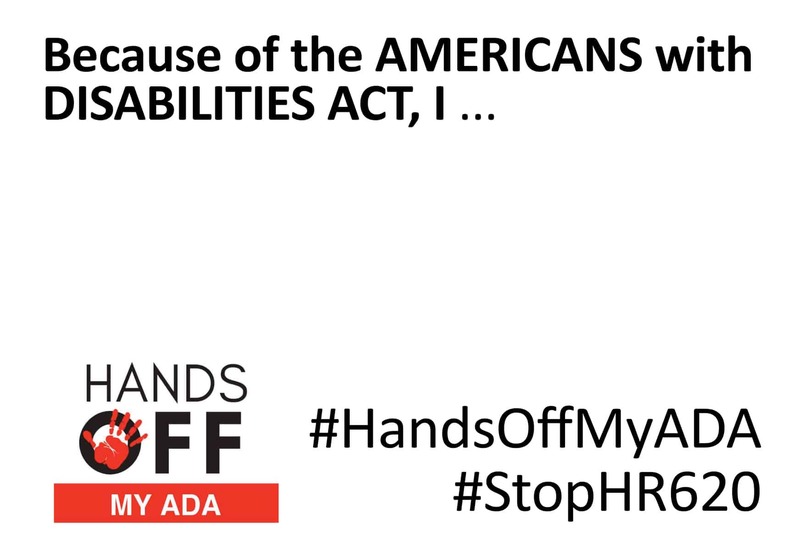 Use the hashtag #HandsOffMyADA to share your story about what you can do because of the ADA. Print out the sign below. Because of the Americans with Disabilities Act, I… can spend money at your business. Because of the Americans with Disabilities Act, I… can get into the building to go to work. Because of the Americans with Disabilities Act, I… can use the bathroom when I go out with friends. Because of the Americans with Disabilities Act, I… know that my rights are human rights! Take a picture of yourself holding your sign and share it everywhere! Justice delayed is justice denied. Use every platform you can to share your message loudly and proudly. And be sure to tag your representative so that they know to keep their #HandsOffMyADA!